Sunday Cheryl and I went to Denver to attend a concert.† It was more invigorating than sitting still and listening.† It was more vivid than mere images forming in the mind as the music flows.†† This concert was ... a whole-body, mind and soul experience.† And since Sunday I've been toe-tappin' and humming, turning over and over the attitude and message imbued in the unreal rock music Young@Heart delivered. The chorus is aptly named, and their mere presence on stage drives that home.† Although the singers range in age from 73 to 89, they are wholly committed to their performances.† They don't let physical aches and pains stop them.† Some chorus members had trouble with the altitude; they hail from Northampton, Massachusetts and Denver is ... well, a mile high.† Others have crippling arthritis, but they keep up with rehearsals twice a week and a rigorous travel schedule.† They've been to Europe a dozen times, and Japan is next. Backstage after the show they greeted groupies and visited amicably with fans.† Just think about how any guest who lives at sea level struggles when visiting here.† Out of breath, thirsty, a bit lethargic.† After these octogenarians used full lung power singing a two hour concert, they graciously played host and hostess! Redefines what aging means to me. I haven't stopped thinking about it.† And I am glad I met them now, in my 50's, so I can make the choice to elder in a better healthier way.† Always said I'd go screamin' and kickin' rather than graciously accepting the inexorable march of time.† But after experiencing Young@Heart, maybe I'll rock on into aging with some attitude and a bit of my own moxie. Their concert made a groupie out of me!† I saw what I want for myself Sunday ...†† an engaged, active life for as long as there's air in my lungs. Check out their music video "Road to Nowhere" here ... and don't expect Lawrence Welk!† This rendition of Stayin' Alive is such great fun.† See how the lyrics pop out more than when Travolta did it! 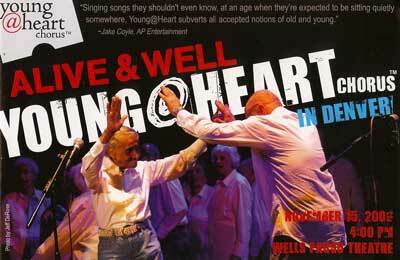 Since Young@Heart tours all over the country, check out their schedule often to see if they'd added a concert near you! This entry was posted on Wednesday, November 18th, 2009 at 8:43 am	and is filed under Aging, Music. You can follow any responses to this entry through the RSS 2.0 feed. You can leave a response, or trackback from your own site.